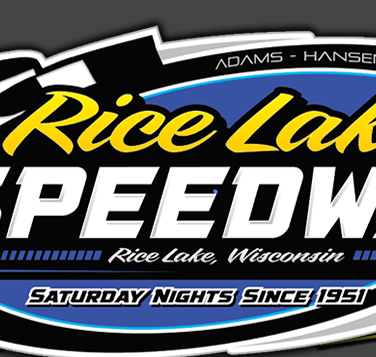 RICE LAKE, WI (April 26) - Dan Gullikson and Mike Truscott made their first visits to victory lane at Rice Lake Speedway since the 2007 race season to highlight the season opener Saturday night. As the 62nd consecutive season kicked off Saturday, Tim Johnson also drove into victory lane for the first time in two years while many time winners Jason Havel and Kevin Adams also won main events. The opening event of the 2014 racing season saw a nice field of cars on hand representing three states on a blustery and cold April Saturday night. Gullikson’s super stock win came in a race that saw the only big crash of the night and one that robbed the fans of a potential great battle for the win. Dave Flynn and Nick Oreskovich sat on the front row for their finale with Oreskovich grabbing the early lead. However, Gullikson moved up from the second row to challenge Oreskovich for the lead. Flynn was running right behind the lead duo with Tim Johnson quickly moving up from the fourth row to challenge along with Eric Olson, Shane Kisling and Jason Forehand. The leaders found themselves running in a tight six car pack as Gullikson continued to challenge Oreskovich for the lead. Coming through turn two, Flynn lost control and spun across the track, chipping Johnson and sending his car airborne. Olson crashed in Johnson, Kisling crashed into Flynn and Forehand also got a piece of the mess, triggering the only red flag of the night. Unfortunately, all four were eliminated from the action with Forehand ducking into the work area for a tire change. Back under green, Oreskovich continued to hold the lead but Gullikson made a strong move in turn three to slide in front and take over the lead. Once in front, he started to pull away from the pack while Willie Johnsen moved in to challenge for second. Forehand was tearing back up through the pack after his pit stop and he moved into the top five. Gullikson built up nearly a straightaway lead as he cruised to the win. Forehand continued his charge as he got past the slowing Oreskovich, who was battling a power steering issue, to take second. Johnsen got nipped by Oreskovich for third with Jim Harris completing the top five. Truscott put on perhaps the most impressive run of the night as he moved up from the tenth starting position to win his first feature at Rice Lake since a 2007 street stock win. A pair of #91 cars of Cory Karshbaum and Paul Suzik battled for the early lead with Karshbaum claiming the top spot. Battling behind the leader for position were Joe Chaplin Jr, Denis Czech and Shane Halopka with Truscott on the move from the fifth row. Karshbaum continued to lead but Suzik pushed him hard while Truscott continued his charge. Working both the low and high side of the corners, he continued his relentless charge, and soon found himself battling with Karshbaum for the lead. With a strong low side move, Mike took over the top spot and then started to move away from the field. Suzik also tried to get past Karshbaum as they worked side by side, while Czech, Halopka and Chaplin Jr raced for third. Halopka found himself in the mud on the front stretch infield, the yellow flew and Shane was placed back in his spot for the four lap sprint to the finish. Truscott pulled away on the start and was unchallenged the last four laps. The #91 cars continued their battle right to the finish with Karshbaum edged Suzik for second and Czech edged Halopka for fourth. Johnson, who stops at Rice Lake a time or two each year and has a remarkable record of taking home the big bucks when he shows up, did it again Saturday as he dominated the street stock main event. Johnson, whose last street stock win in 2011 at Rice Lake was the “Little Dream” and also took the Rhoe super stock special in 2012, led from start to finish to take the street stock honors. Tim started outside in row one and Cody Kummer gave him a hard push for a couple of laps before Johnson gradually began to pull away. With only a first lap yellow for debris to slow the event, Johnson gradually and relentlessly pulled away from the field. However, Kummer had his hands full with a rejuvenated Scott Clark for second. Clark, a former kingpin in the street stocks until taking a few years off and running just a few events last year, came out for the opener with a vengeance, as he put on a strong challenge to Kummer. Kummer was up to the challenge though, and while Clark drew beside him for second on several occasions, Cody hung tough and brought home the second place prize behind a cruising Johnson. Sam Fankhauser raced up from the fourth row to take fourth ahead of Ron Hanestad. Havel has been a big winner in the pure stocks for the last several years at area tracks and he started out 2014 with another Rice Lake win. Havel started on the outside of row one and took the early lead, an advantage he would maintain throughout the nonstop main event. Former point champion Nick Traynor had a nice run too, as he took the second spot right at the start and hung right with Havel, staying within a couple of car lengths most of the race. While the leaders pulled away from the pack, John Erickson was making the charge of the event, having started in the eleventh spot and quickly moving to the front. Erickson joined a good battle between Jimmy Holden, Joel Hinrichs, C.J. Wagner and Jay Folz and that group of cars slugged it out for position. Traynor made a big dive at Havel as the white flag waved but he couldn’t quite get under Jason, who drove on for the win. Erickson continued his charge as he raced into third at the line ahead of Holden and Hinrichs. Adams won the modified feature but he was pushed right to the finish by a relentless Don Eischens who would not give up the challenge and nearly pulled off the win. Mark Hessler was the early leader of the race with Keith Tourville and Tim McMann challenging him for the lead. McMann put considerable pressure on Hessler and nearly got by on a couple of occasions. Meanwhile, Adams was moving up from the seventh starting position using the low side of the track and with a dive under McMann, moved into second. Adams then put the pressure on the leader and slid past Hessler in turn four to take over the top spot. Eischens took a little longer to get to the front, but once he pulled into second, he began to close on Adams and the race was on. Eischens found a nice line on the track and quickly closed on the leader. With a dive into turn four, Eischens slid under Adams to take over the lead but Kevin got up on the wheel and returned the favor in turn one. A late race yellow for debris set up a five lap sprint to the wire and Eischens remained glued to Adam’s rear bumper off turn two on each lap. Kevin adjusted his line near the end of the race and that allowed him to gain a couple of car lengths, a margin he held to the finish. Hessler hung on for third ahead of a charging Pat Hoffman and McMann. 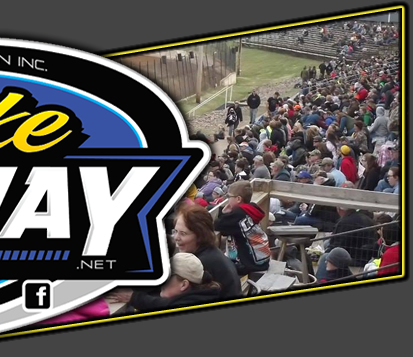 Racing action will continue next Saturday night with hot laps slated for 6:30 p.m. with racing to follow. 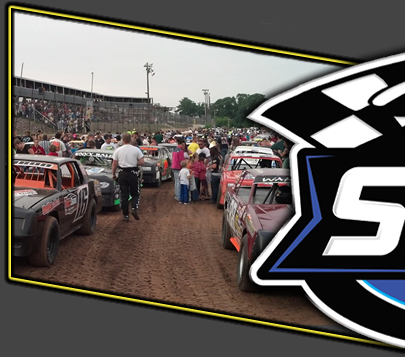 The first special event of the season will be on Thursday, May 8 when the United States Modified Touring Series will visit Rice Lake Speedway. WISSSOTA sanctioned Midwest Modifieds and Pure Stocks will join them. Race time is 7:00 p.m.